Homemade Protein Bars are easily prepared from scratch and are so good and nutritious for your body. My homemade protein bars recipe has a smooth non-chunky consistency, is made without protein powder, includes organic ingredients and comes gluten free. Wonder how I made the bars? You might remember that I mentioned in my Bircher Müsli recipe how I got into the Tabata 4 minute HIIT training. Well, I got a way to keep myself motivated and going by dangling a figurative carrot in front of my face. That would be these nutritious from scratch protein bars which I am happily munching on after a workout. Protein Bars should stabilize my motivation and interest to keep up the good work. Does my mind game sound familiar to you? Yet, homemade protein bars are a healthy snack designed to feed your cells and muscles. I love them but they are sometimes very pricey and the bottom line is that most of those commercial bars taste horrible. It took me some time to come up with the formula and I wouldn’t have made it without my dear friend Shannon from Just as Delish. What’s in homemade Protein bars? 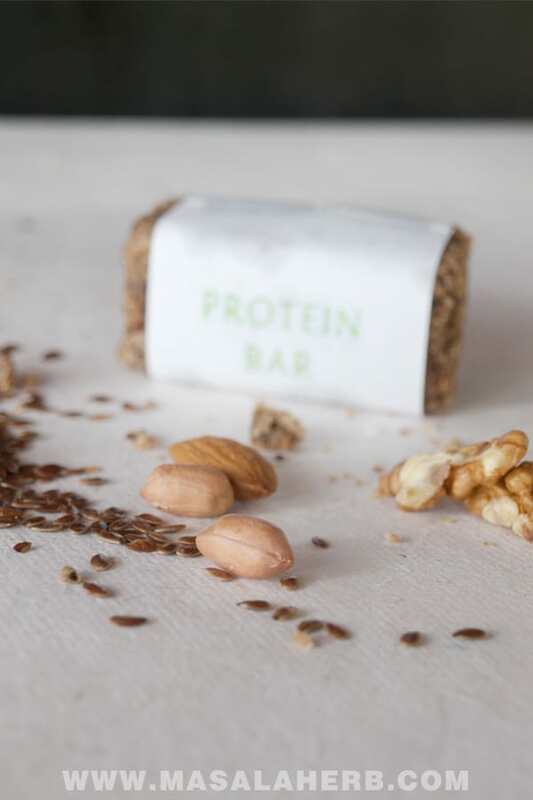 These pretty little Protein Bars include Protein rich natural organic ingredients such as oats, flax seeds, different nuts, dried fruits and milk powder. These homemade protein bars are complete without protein powder! Hence, by keeping out the Protein powder in this recipe, you know at least what is in your protein bars and the milk powder is any way rich in Protein and it replaces the Protein powder like no another here. If you want to make these protein bars vegan then just use almond milk powder! Further, the nuts provide a good amount of Essential Omega Lipids, which our body requires together with the proteins to build up lean muscles. Although, the protein bars are better digested in smaller sizes, and that is why I am making mine smaller. The weight of my homemade protein bars is 70 grams, which is a nice portion for a girl. Maybe boys would need a bigger intake to feed their muscles. However, you can cut them up as you like and then store them in an airtight container, away from humidity. 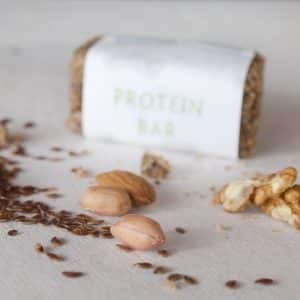 The homemade protein bars are prepared without protein powder but include instead organic health ingredients, enriched naturally with proteins and various essential omega oils. The homemade protein bars recipe is gluten-free and can be prepared vegan too if you choose to use vegan protein powder [see ingredient list below]. The bars turn out fine inconsistency but are very firm, so they make a perfect portable snack. I enjoy them after workout however you can have the organic protein bars too during break time at work or in school. The bars will help you to improve your energy levels and to focus better. First, we will grind the dry ingredients fine. 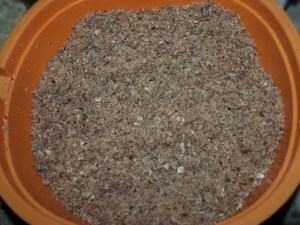 Grind your Oats, Flax Seeds, Walnuts and Peanuts and place the ground ingredients into a mixing bowl. 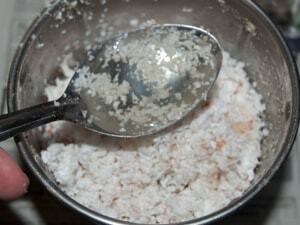 Grind the shredded Coconut with the Coconut Oil and add it to the dried ingredients. 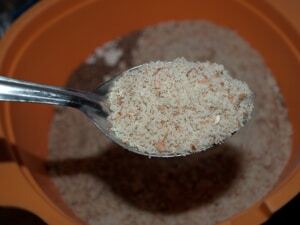 Also add the Almond flour and Milk powder to the mixture. Continue to grind the Raisins. It will turn into a sticky mass. Keep aside. 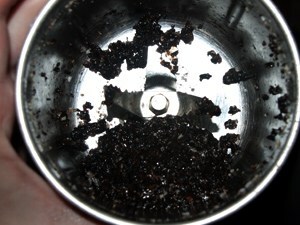 Remove the seed core from the dates and grind those as well. 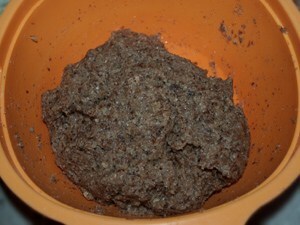 Add the raisin and dates mixture to the other mixed ingredients and crumble the dried fruits with your hands into the other dry ingredients so that they get properly incorporated. To finish the mass mix your honey into the hot Water and pour it all over the whole mass. Mix it properly! Preheat your oven to 320 Fahrenheit/ 160 Celcius. Now grab your mold, preferably a squared one (I don’t own a squared one as you can see) to make your life easier, and grease it with the Coconut Oil. Spread your mass equally into the mold. Bake at 320 Fahrenheit/ 160 Celcius for about 20 minutes. It should be still soft and not too dry when ready. Keep it to cool and then cut your bars into your desired size. Store in the fridge! Dear Reader, what health program are you following right now? We go through a lot of protein bars, so I’m thrilled to have a way to make them at home. Your recipe sounds great! Let me know how you liked them if you get the chance to try the recipe. By the way if you need more details about the protein amounts in each ingredients, I have a list here. I just didn’t post it here. These look really good. As you say, the flavor of most protein bars isn’t appetizing, so I rarely eat them. These look exceptional, however. I’ve never thought of making my own, and as your recipes shows they’re not at all hard to make. Terrific idea – thanks. Yes the recipe is quite easy and hassle free. 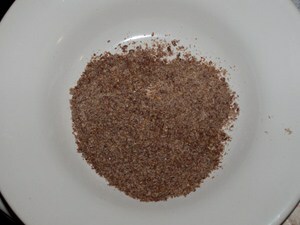 You can add lightly crushed ingredients if you are in a hurry instead of grinding them all as mentioned above in the recipe. I prefer that the ingredients are properly incorporated and the flavors get better mixed, further the bars don’t fall apart so easily, they are more compact. Oh I love how you grind all the ingredients and bake them! They look solid after cutting, loves recipe that doesn’t crumble. must try your recipe soon. and your photos are amazing! Thanks for mentioning my blog & linking my recipes. You are welcome Shannon, your work is amazing. =) Oh and yes they don’t crumble at all. Every morning during the week I eat a protein bar before my workout. They have been store-bought but I would much rather have homemade. I must make these soon. These are probably the healthiest bars I´ve come across and a recipe I might actually make very soon! Store-bought granola and protein bars are unreasonably expensive, I totally agree with that. I’ve really been wanting to make my own protein bars/granola bars/etc….yours look pretty spectacular! These are gorgeous Helene. My sis makes granola bars and they are super yummy. It’s just something that tastes so much better fresh. You take such beautiful photos. Very cool recipe! We spend a fortune on protein bars and powder. This is a very handy recipe! These look delicious, much better the store-bought stuff. I’ll have to check out Shannon’s recipe as well. I love the texture of these bars. 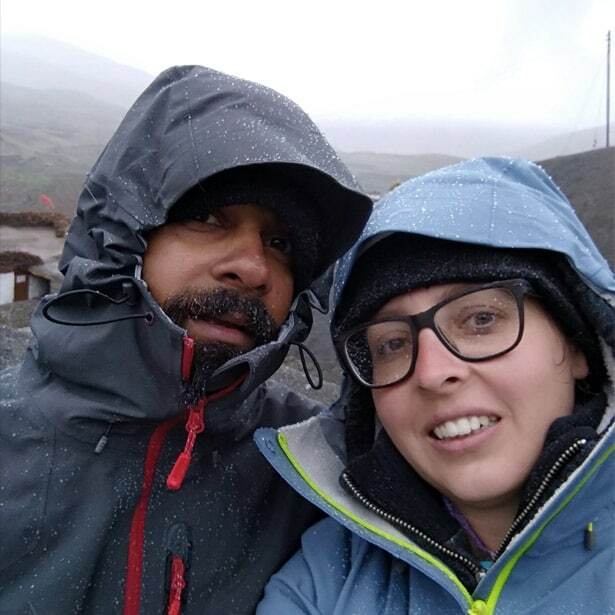 Great images Helene! Well, these don’t look too hard to make. Love all of those rich, high protein ingredients!! Lots of good stuff. Love the little wrappers you made. So clever!!!! These bars sound really good. I especially love every single ingredient in them. Love making my own snack bars at home. So much healthier than the store bought ones. These look great! Oh my goodness, these look so yummy! Hi Helene, These look good. A question – I am not a fan of dried fruit in bars like this. Any suggestions of what I can replace them with? I love protein bars. I think I need to start making my own instead of buying them! Thanks for sharing this recipe. I will be making these bars very soon! I love these homemade protein bars! I’ve been looking up recipes for Lara bars, fruit leather, and granola bars but I haven’t seen any for protein bars yet. I’m glad you didn’t use protein powder (it freaks me out!). Everything in here is natural, delicious and healthy! can you please share the amount of protien in one bar and what will be the size of one bar? The size depends on you, you can cut them into your preferred size. I cut them into 5 cm x 3,5 cm cubes. The protein amount should be around 8-10 grams per cube/square. Of course it depends on how you cut them up at the end. Dear Helena please advice me on what to replace the milk powder with while retaining it’s consistency. I have been having problems with protein bars that crumble. You can keep out the milk powder if you want, it shouldn’t change the consistency. Have you tried this protein bar recipe before? Dear Helena. Thank you for the tip. I am trying out your recipe tonight. Sorry Helene I spelled your name wrongly before. Yes sure try it out and let us know here how you liked it. Others will definitely appreciate your input. I love homemade protein bars!! These would be perfect after going to gym! YUM! Those sound so good! I eat a lot of protein bars so I love making my own at home. Definitely a good way to save a few bucks! What a great idea to make protein bars from scratch! I am in the habit of buying them at the grocery store- but these look so much better. These sound so good and I love this sort of healthy, sweet on-the-go snack! Healthy and delicious…I need one right now! This is one recipe that I tried making once upon a time as the bars that you get in the market use sugar and they are pathetically costly. 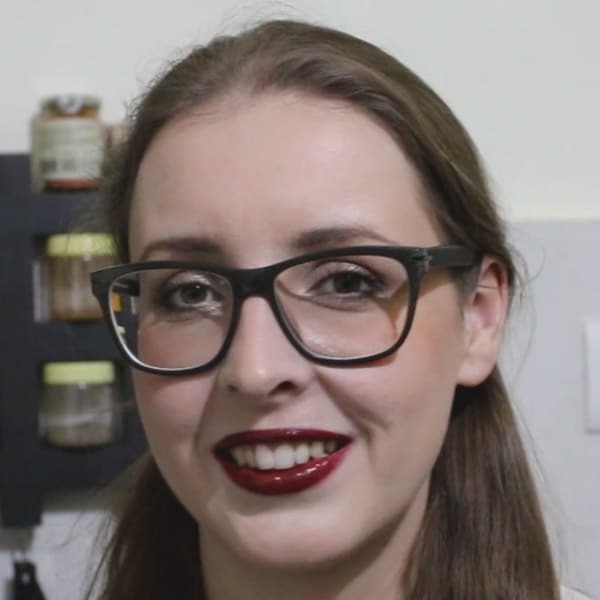 However, I could never get the consistency of the bar – it became very fluid and I had no idea how to bind it, Maybe I got the quantities all wrong or missed some key step in the process. 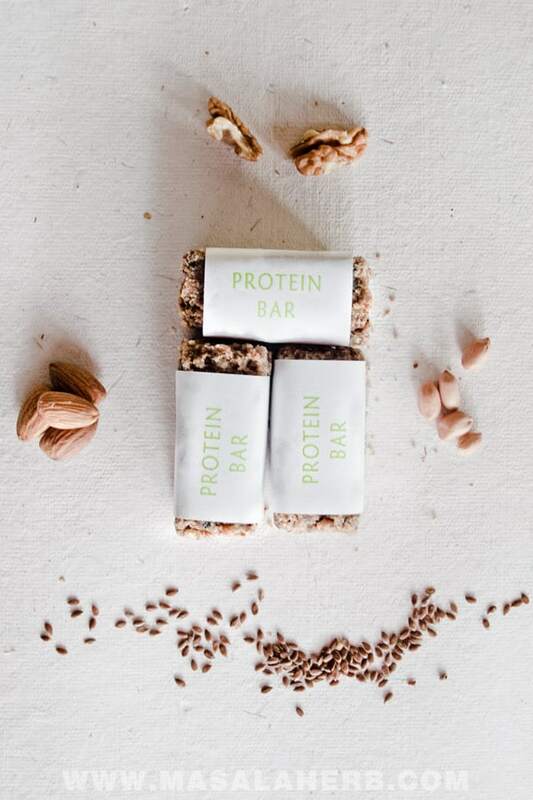 Protein bars are great to carry as a snack for traveling. Easy to carry and source of instant energy. I’m not a fan of protein bars in general, but if I must have them then home made ones are the way to go. You can be safe from all the unnecessary stuff that the store bought ones have usually. We are trying to eat a more plant-based diet in 2018, not eliminating meat, just reducing significantly. 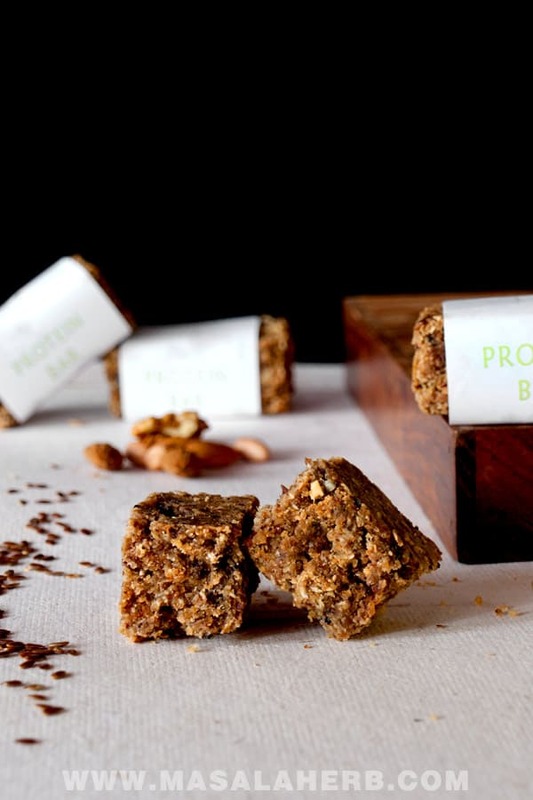 These protein bars look great, just the type of motivation needed to stick to a program. I’m a big fan of protein bars (especially at this time of the year! 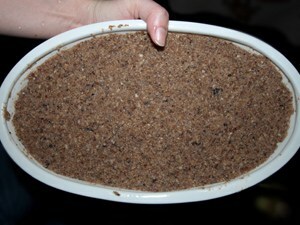 ), so I’m thrilled to find your recipe! They look really good! Love that you made these without the addition of protein powder! I need to try these! Hi, this may be interesting you: Homemade Protein Bars Recipe!